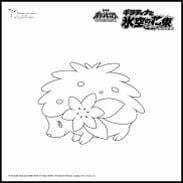 Stop This Finger (このゆびとまれ) is the theme used for the 2008 Pokemon Theatrical Edition Coloring Contest. 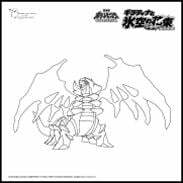 Winning entries in the contest will be displayed after the ending credits of the second Diamond & Pearl movie, Giratina and the Sky Bouquet, Shami. Click on each image above to view the .pdf file fans in Japan would print out to enter the contest. Kono Yubi Tomare is the name of the technique known as "Follow Me" in the English versions of the games. The song features many pokemon (shown in red below) and technique (shown in parenthesis)-based puns that are really difficult to translate into English.